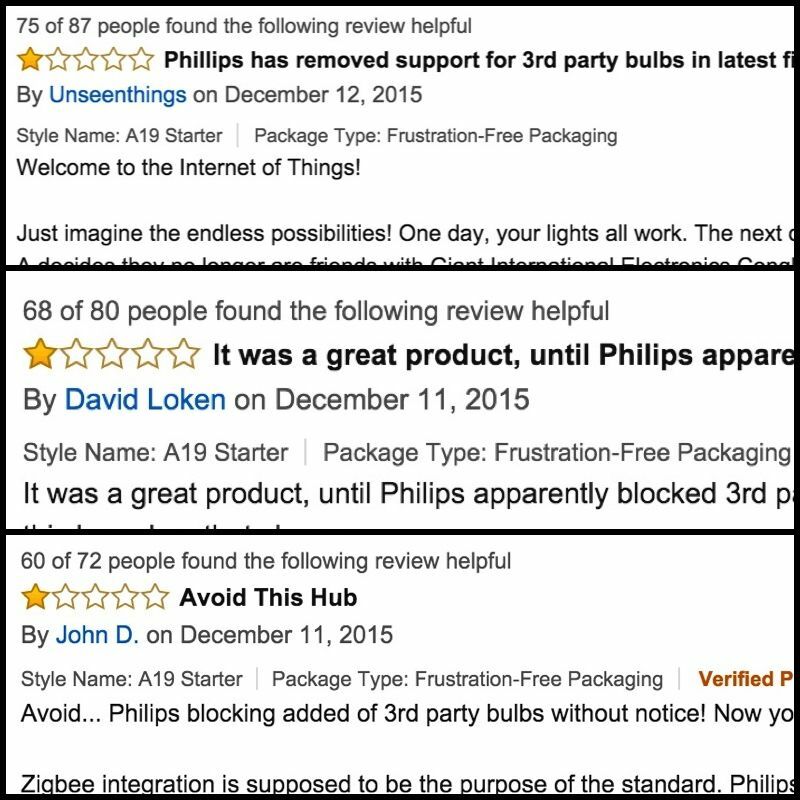 I’ve been thinking long and hard about what made me so frustrated with the latest Philips decisions. I think I finally got to the root cause. It’s a matter of empowerment. Philips Hue is an empowering product. Being able to switch on and off all lights in your house from your smartphone is pretty cool. On an empowerment scale from 1 to 10, I’d rank that at a solid 3. Why not more? Because being able to remote control your lights isn’t all that new (remember the Clapper?) and having to pull out your smartphone, unlock it and start an app also adds a level of complication to a task that used to be as simple as flicking a physical switch. But it’s empowerment nevertheless. And you can do more than with regular switches. With the October 2015 release of the Hue 2.0 hub, Philips added support for Apple’s HomeKit. HomeKit is an empowerment booster, especially if you combine it with yet another empowering product, the Apple Watch. Raise your wrist and say “Hey Siri, dim the living room lights” and you have just risen from level 3 to level 7 on the empowerment scale. And here’s where Philips dropped the ball, several times. The 1.11 firmware update removed empowerment. It locked out 3rd-party bulbs from the system. It turned powerful human beings into powerless ones. And this disempowerment was the main reason for a massive public outcry. Apart from the simple fact that they took something important away from their clients, here’s where I think Philips didn’t handle this well on a different level: it’s in the way Philips marketing communicated to their angered customers. Let’s be clear: Philips is a big corporation and the one thing big corporations fear is loss of control. They do everything to control the message. Which resulted in repeating the same carefully crafted messages over and over again. What they didn’t seem to understand is that they are now acting in an age of empowered consumers. People will do research before they buy a product, they will check several sources before making a decision. And if you disempower consumers, they will make their voices heard. Philips finally came around and gave in to the public pressure, by announcing and delivering the updated firmware 1.12 that returned support for 3rd-party bulbs. You would think that at this point the story was over and everyone lived happily ever after. Unfortunately that’s not the case, because Philips restored the (level 3) empowerment without restoring the full (level 7) HomeKit empowerment. Firmware version 1.11 (and all subsequent updates) has killed 3rd-party bulb support with HomeKit. Support for this feature was never official, but it worked well enough and became a fact pretty quickly. And 3rd-party bulb support is an absolute necessity in the Hue ecosystem, simply because it doesn’t offer certain products that people need: there are no Hue bulbs with an E14-socket socket, no garden lights, no switchable power outlets, no in-wall dimmers. The list is long. – so if you have to use an E14 bulb, you can’t get it from Philips, but instead have to go to someone like Osram. To be clear: this is about 3rd-party bulb support (which Hue has restored with the 1.12 update) with HomeKit integration, which got disabled in the 1.12 firmware. Option 3: find a HomeKit-enabled hub that speaks ZigBee LightLink (the protocol that Hue understands) and that integrates all your ZigBee bulbs under a new roof. Is there such a product? I’ve talked to the Hue CEO about this and written a bit more about it here.